Android TV isn’t for everyone, but its particular charms will be irresistible to some streamers. When we talk about streaming, the conversation usually centers on the most consumer-friendly options: Roku, Amazon Fire, PlayStation, and Xbox. Google, of course, Chromecast, a serviceable streaming stick held back by its lack of a remote, as its primary focus. But the company has another streaming device that’s worth considering for users who hate the closed ecosystem of Roku and Amazon. Android TV is a more complicated system than any of the other streaming solutions on the market, but it’s also a considerably more powerful system.Curious about what pleasure Android has been hiding from you? Here’s everything you need to know about Android TV. Android TV is a smart TV platform from Google built around the Android operating system. Users can stream content to your TV via apps, both free and paid, using your internet connection. On that front, it’s the same as Roku and Amazon Fire. You navigate through menus the same way, using your phone as a remote to guide you as you go. Unlike other devices, however, Android has an open system, giving Android TV access to apps Google might not officially approve of. Beyond its impressive streaming capabilities, Android TV can play emulators, run apps, work as a media player for your digital files, use Kodi, and can even connect to a TV tuner. The downside is setting up all those features can require more technical prowess than many users have or want to learn. If you have a favorite cord-cutting service, Android TV almost certainly supports it. Netflix, HBO Now, Showtime Anytime, YouTube, Spotify, Hulu, and Starz all have apps, but you might be surprised to find the wealth of other options available. Disney, CNN, Red Bull all have apps ready for your viewing pleasure. Looking to game? Minecraft Story Mode, NBA Jam, and more have been ported over to the system, along with all the emulators that can easily be found in the Google Play store. At the moment there are only three live TV streaming services that work on Android TV: Sling TV, FuboTV, and YouTube TV. Of the three, Sling TV is the best deal, with plans starting at just $20 per month. FuboTV has a focus on international sports programming rounded out with favorite cable channels like Bravo and Nat Geo, for $39.99 a month. Finally, YouTube TV offers a general plan with 50 channels for just $35 per month, with unlimited DVR recording space. Each package has pros and cons, which you can read more about in our live TV streaming guide. There are only a couple of ways that you can access Android TV. You can either purchase a smart TV that already has Android TV enabled—the Sharp AQUOS or Sony BRAVIA—or a streaming console that supports Android TV: Mi Box, NVIDIA Shield, Razer Forge TV. Here are the two best options for getting started. 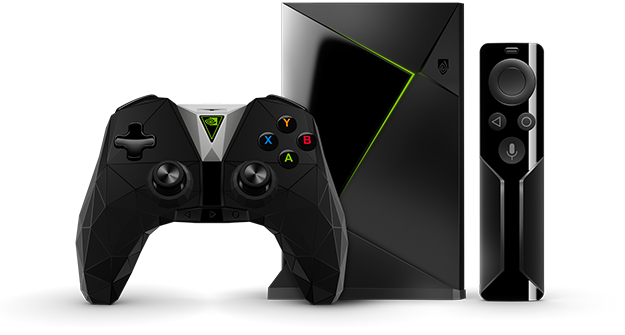 For Android fans who want to experience console-level gaming and 4K streaming, the NVIDIA Shield TV is a worth of your consideration. Starting at $149 for the basic Shield, which comes with a voice remote and 4K HDR output, and ending with the Shield Pro, a 500GB 4K HDR mini computer with a built-in Plex media server for $299.99, the Shield family can meet any set of needs. Only the midrange Shield 16GB and Shield Pro come with a game controller, so if you’re looking to play with the basic Shield, you’ll need to pick one up. While it doesn’t support a wealth of modern-day hits, recent classics like Borderlands and The Witcher III can all be played on the system. It’s expensive, but you get a remarkable amount of power for your buck. Sony’s smart TVs pack a remarkably high-quality image, whether you’re looking at a basic $649.99 model or a top of the line $3,999.99 unit. Both models come packed with a 4K picture and Android TV built-in. You might be surprised to learn these models can still sideload apps from outside of the Google Play store. With Roku and Amazon each offering respectable budget 4K smart TV options, it’s nice to see a player like Sony follow suit. Where Android TV separates itself from its peers with its app store, ability to cast video, and Google Assistant features. Android’s Google Play app store is stocked with both apps and games, making Android TV a budget-priced gaming console. Users can use a third Bluetooth controller to play games, and some models come with their own controllers. Beyond the official store, Android TV allows you to install third-party apps from unknown sources, opening up your device to a world of possibilities and dangers. Want your streaming device to also work as a SNES emulator? Android TV can do that provided of course you’re prepared for the possibility of bricking your device if something goes wrong. Official Android TV devices support Google Casting, allowing you to stream video and audio content from your phone onto your TV. This feature only works with certain apps, but most major streaming services support it. Casting might not immediately seem like a massive selling point, but especially around the holidays, it’s nice to be able to pull up photos for the whole family to see, directly from your phone. Finally, Android TV features the useful bonus of Google Assistant, a handy tool that allows you to ask questions, pull up content, check the news, and control smart home devices all via voice command. Best of all, unlike Amazon Echo or Google Dot, this Google Assistant isn’t always on. You have to press a button on your remote to activate the feature, giving you privacy and smart home controls built into your TV. Android TV offers the most options and customization of any of the conventional streaming systems available on the market. It’s far more power than some people will want or need, but when you want to go further, Android TV can take you there.